This promotion is officially over. 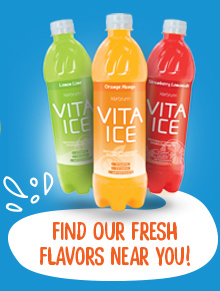 Visit the Klabrunn website for more information on Vita Ice®. You can email support@cravethecolor.com with any other support or order related questions. NO PURCHASE NECESSARY. A PURCHASE WILL NOT INCREASE YOUR CHANCES OF WINNING. Klarbrunn Vita Ice® Crave the Color Program. Program is open only to legal residents of the U.S. as of May 14, 2018, who, at participation and entry, are at least the age of majority in their state(s) of residence and reside in state(s) where the Program operates. Program begins May 14, 2018, at 9:01 a.m. CST and ends September 24, 2018, at 4:00 p.m. CST. Odds of winning depend on number of eligible entries received. To obtain code, send request and self-addressed stamped envelope to Klarbrunn Vita Ice® Crave the Color, PO Box 8006, Madison, WI 53708. Limit one code per request per mailing. Void where prohibited. Sponsored by WIS-PAK, INC., PO BOX 8006, Madison, WI 53708. Subject to full Official Rules, available at www.cravethecolor.com/rules.php. Klarbrunn Vita Ice® is a registered trademark of WIS-PAK, INC.
Log in and fuel your craving for gifts. Sign up to enter points and score big.